Micron Laser Technology specializes in PCB laser processing and services for many of the largest international PCB manufacturers and contract assembly. 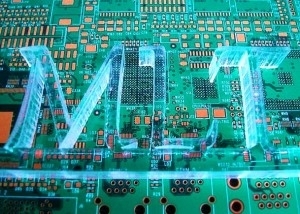 For more than 20 years, MLT has perfected laser processes and techniques that have advanced PCB manufacturers industry-wide. Our PCB laser processes our customized for both rigid (PCB) and flexible circuit (FPC) applications. Most every possible PCB material stack-up has a laser parameter set or recipe maintained in a material database for quick setup and delivery. Micron Laser Technology is experienced with all conventional dielectrics and chemistries used in rigid multilayer PCBs, FPCs, rigid-flex printed circuits, ceramics, and high-frequency materials. These may include Kapton™, polyimide, FR4, Isola, Getek, Nelco, Hitachi, Rogers, Gore, RCC, LCP, ceramics, speedboard, Teflon, Mylar, Duroid, acrylics, Ultralam, PEEK, PTFE, and FEP to name a few. For a more detailed listing of laser compatible materials used in PCB manufacturing, click PCB Materials. To view Rigid and Flex PCB Laser Services brochure, click PCB Laser Services Brochure. Multiple CAD tools and custom file converters enable PCB laser programming from customer-provided data. Most laser drilling, routing, and skiving applications can be generated by DXF, DWG, Gerbers, and Excellon drill file formats. In most cases, non-scaled data is required as MLT will make the appropriate scaling or offsets to meet part dimensions. If concerned about compatibility of your data format or CAD/CAM tool, please contact MLT Sales for more information. For more CAM/CAD guidelines and detailed requirements, click CAD Requirements. � Copyright | Micron Laser Technology, Inc. | All Rights Reserved.